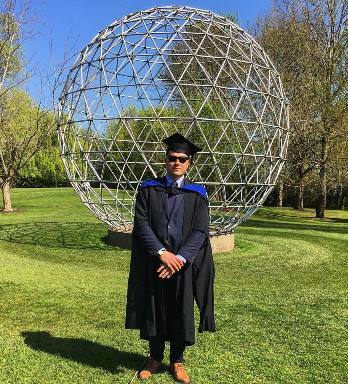 Zander graduated with a MSc in Sustainable Development in 2016 and now works in his dream job as a Sustainability and Stock Coordinator in the biomass industry. The main choice was made because I am originally from Guildford, but the course looked great. It covered everything I thought needed to be covered. The campus was great and easily accessible from the town. It also provided the opportunity to get an internship as well. I loved the people who were on it, I made great friends. I also loved the way the modules were intensive week courses, which allowed me to work alongside the course. All the topics were interesting and the lecturers were great! I still keep in contact with some of them. I went on some great trips and managed to get an internship which led to getting a job, so I have my current life because of the course. I think I grew up and realised what I wanted to become, it helped define my future. I worked hard and had fun at the same time. The strangest part was that I got so engrossed in my course that I turned from an avid meat eater into a vegetarian just because of what I was learning about the impact of my life on the environment. I am now a Sustainability and Stock Coordinator for a biomass company, based in Albury, Surrey. I love my job because it is dealing with renewable energy, the environment and sustainability. I get to head out into the woods and look at trees, go for meetings in Canary Wharf and then seminars with guest speakers including Michael Gove, Prof Richard Murphy and other influential speakers. I love that I have found a job in an industry I am interested in and that I found a company that lets me progress as the company progresses. I am currently working on a sustainability strategy for the company and creating my own path. It’s great! I owe my career to the University of Surrey. We visited the company I work for on a university trip, and I got the internship because of the course and got my job because of my internship. I still keep in contact with the Surrey and hold yearly trips for students. I also am in constant conversation with the professors and lecturers about other projects as well. I hope to get a Surrey intern at some point to afford them the same leg-up that I was given. It sounds weird, but writing my dissertation in the library over the summer, with my friends, good music. We were all working towards our goal and one by one we all finished. All the main students had left and it was just us. There was real camaraderie between us and it cemented all of our friendships! Tough times, but great times. What aspects of being connected with the alumni network are most important to you? It’s always good to keep connected, you never know when someone else will pop back up and have that Surrey connection!